BMC Remedy is the most comprehensive and capable ITSM software that automates the operations of ITSM process areas and enables organizations to align their business services with their IT infrastructure. Kovair Omnibus integration can increase the value of your Remedy investment by bridging the disjointed operations of ITSM process areas like incident, problem, change, and configuration management with a unified system. ‘Kovair Remedy Integration Adapter’ integrates BMC Remedy with Kovair Omnibus platform. The integration is aligned to Release, Incident and Problem. Incident or Problem Management is reactive and is typically initiated in response to a customer call or an automated event. The adapter automatically handles essential Remedy data in the background and updates the Omnibus platform. The Omnibus platform can route those events to other tools hooked in the ecosystem. Omnibus integration supports bi-directional synchronization of data which includes attributes of artifacts, attachments and work log. BMC Remedy ITSM runs on the BMC Remedy Action Request (AR) System platform that provides AR API that is used by the Kovair Remedy Integration Adapter to communicate with the BMC Remedy Server. This communication takes place via AR .Net API. This API communicates with the AR C API for accessing data. Thus, Kovair Remedy communicates with remote Remedy server for integration. Why Integrate Remedy with Kovair? ALM-ITSM Convergence: Most organizations satisfy their Application Development and Technical Support teams with disparate, best-of-breed tools. This encourages silos and results in significant administrative burden. Organizations need to eliminate these silos and introduce an integrated ITSM and ALM strategy so that Development staff can have better visibility of business requirements and Support staff can have better visibility of development activities. This ALM-ITSM convergence is made possible by Kovair Omnibus Integration Platform to which you can integrate development tools, such as JIRA and QC as well as ITSM tools, such as Remedy and ServiceNow. The adapters required for connecting these tools to Kovair Omnibus Integration Platform are provided by Kovair. Kovair Remedy Integration Adapter is exposed in Omnibus as a bi-directional adapter. Events occurring in Remedy and their corresponding data are propagated across the integrated scenario for other tools to consume. Integrated Service Desk: Service Desk plays an important role in running critical business operations smoothly. IT organizations are always under pressure to improve their service levels. However, Incident Management processes are often not standardized and incidents are not prioritized in accordance with their business impacts. The problem is compounded when there are multiple service desks in an organization and they are not tightly integrated. For organizations that want to phase out multiple Service Desk tools and associated processes to enhance operational efficiency, Remedy’s Service Management application is the ideal solution for them. Kovair’s Remedy Integration allows organizations to utilize the benefits of an integrated service desk system by integrating Remedy with other Service Desk tools. Enhanced Collaboration: By integrating the Service Desk application of BMC Remedy ITSM suite with collaboration tool like SharePoint or a CRM tool like Salesforce.com (SFDC), Kovair Remedy Integration Adapter improves collaboration between Development teams and Technical Support teams and accelerate the correction of customer-reported issues. For example, service requests from SharePoint can be sent to Remedy and processed there, and SharePoint users can get real-time status and updates of their service requests. Similarly, SFDC cases can be passed through existing workflows in Remedy and the updated status of a case can be sent to Remedy to keep both the tools in sync. Basic events like Add and Edit are supported for all entities. Basic action like Add, Edit, and Delete are supported for all entities. 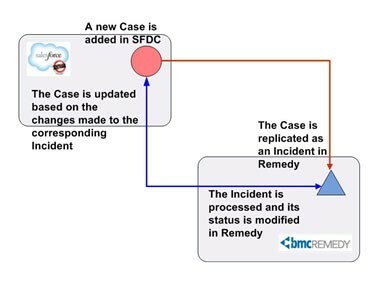 Remedy-SFDC Integration As shown in the above example, you can integrate the Remedy and SFDC so that Cases in SFDC are replicated as Incidents in Remedy. The Incidents are processed in Remedy, and any modification to an Incident in Remedy is replicated in the corresponding Case in SFDC. 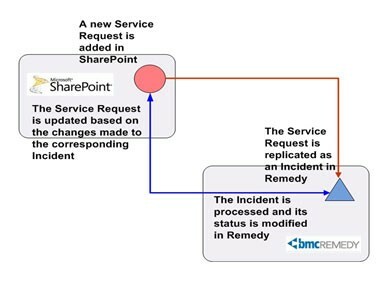 Remedy-SharePoint Integration As shown in the above example, you can integrate Remedy with SharePoint so that Service Requests entered by users in SharePoint are replicated as Incidents in Remedy and processed there. Any modification to an Incident in Remedy is replicated in the corresponding Service Request in SharePoint. Integrates operational systems with Quality Management and ITSM solutions. Powerful and proven Omnibus workflow engine enabling automation of service desk processes. Bi-directional synchronization of artifacts, such as Incidents, Problems, Changes, and Releases with attachments and related work logs. Allows you to manage relations between the exposed entities of Remedy. Improves efficiency and accuracy by eliminating redundant data entry. Delivers a two-way replication between a Remedy system and other connected tools. Exhibits minimal impact to application performance.